This game has uncompiled source code. The red-hatted stepchild of the Mario Kart franchise: a Namco-developed arcade racer in which Mario and Pac-Man meet for the first time. Snubbed by Nintendo in the numbering of Mario Kart 7 and later 8, the game and its sequel both feature cameras mounted above the screen and magnetic save cards for recording progress. 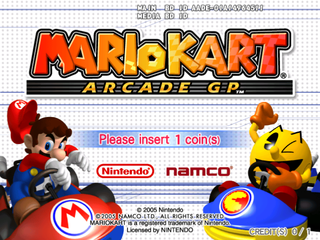 Three JPG images exist in the Arcade GP ROM: camtest00.jpg, camtest01.jpg and camtest02.jpg. It can be assumed that these were somehow used during testing for the NamCam player portrait feature. The EXIF data of all images shows they were processed with Adobe Photoshop Elements 2.0 in 2004. Possibly a color test. EXIF data shows it was modified on 10th October 2004 21:34:06. 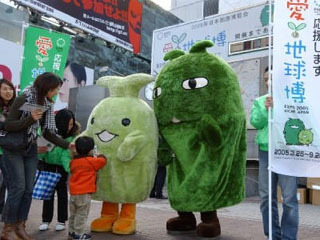 The second image depicts the mascots of Expo 2005 in Aichi, Japan. EXIF data shows it was modified on 14th December 2004 20:00:51. The source of the third picture is slightly... bizarre. It is a picture of the Beslan school hostage crisis, a terrorist attack where over 1,100 people were taken hostage by armed separatist militants in a school in Beslan, North Ossetia (Russian Federation). Originally photographed by Yuri Tutov, and can be purchased from Getty Images. EXIF data shows it was modified on 9th September 2004 12:25:57. Whether these make up a complete, playable course is not yet known. Some server information. This file can be found in an archive along with a file named Entries, which contains a full list of assets. Yamana refers to staff member Masami Yamana. A header file with an index of defines for sound effects. "Jyugemu" is the Japanese name for Lakitu. "finalrap" is "final lap". Sorry to disappoint. This page was last modified on 19 January 2019, at 13:37.